See historic photo at bottom. 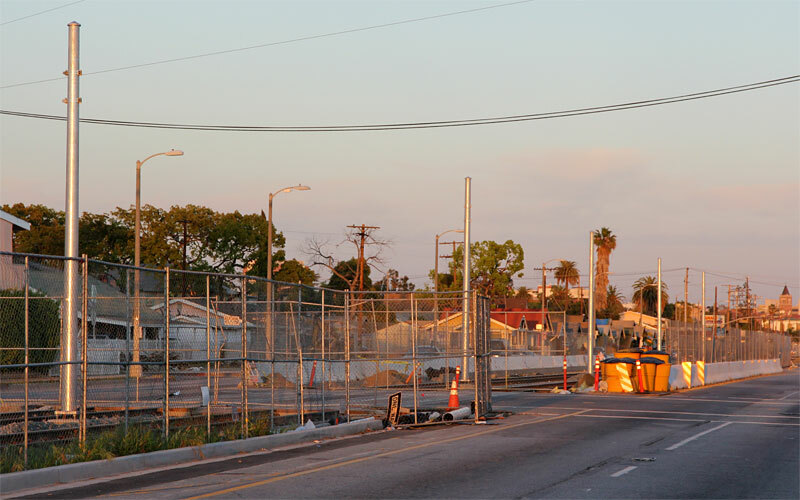 11/23/11 — Metro's The Source posted this video of riding from Western to Crenshaw. 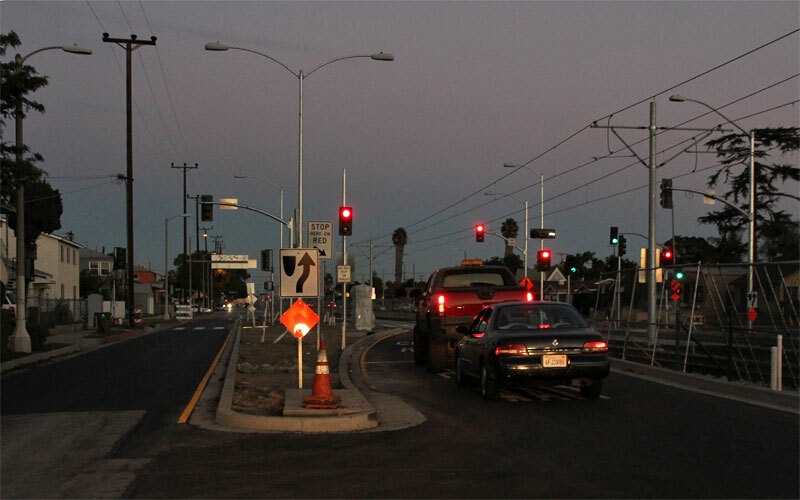 9/28/11 — A westbound test train approaches and crosses Farmdale Ave. Note the LED warning signs. 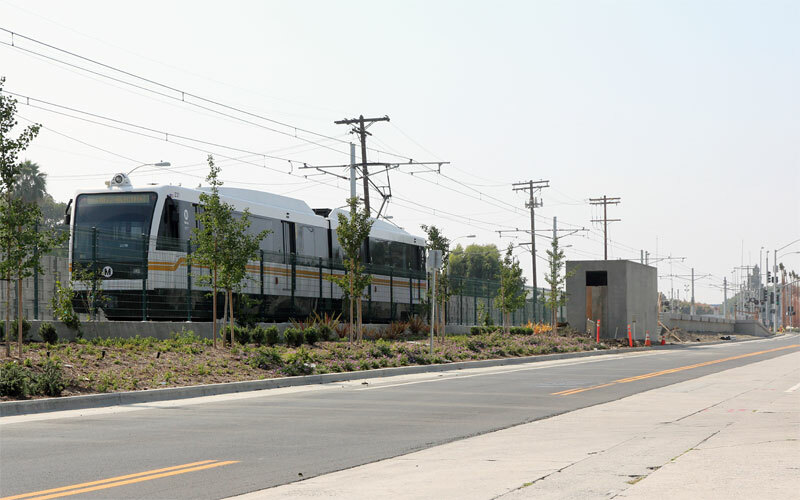 7/27/11 — Extensive landscaping is now in place. West of Farmdale (above) has signature palms at the station and ginkgo billobas beyond, filled in with a variety of lower plants. Even the narrow strips between Western and Vermont (at Denker, above) are well done. 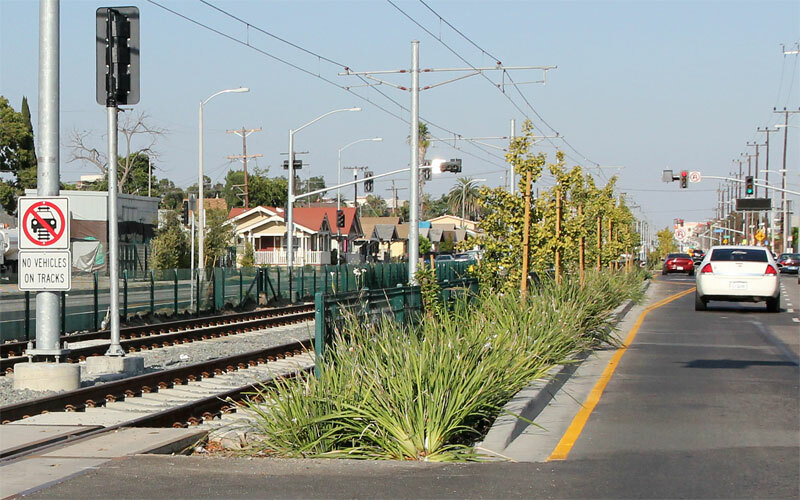 Expo is far and away the best-landscaped rail line in Los Angeles. 4/8/11 — The test train ran under its own power for the first time this morning! 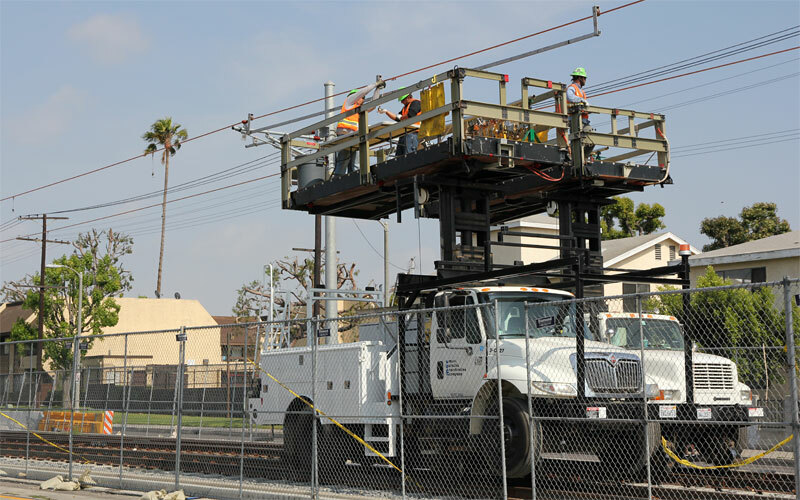 3/29/11 — Trucks with pantographs appear to be testing top clearances and catenary near Gramercy. 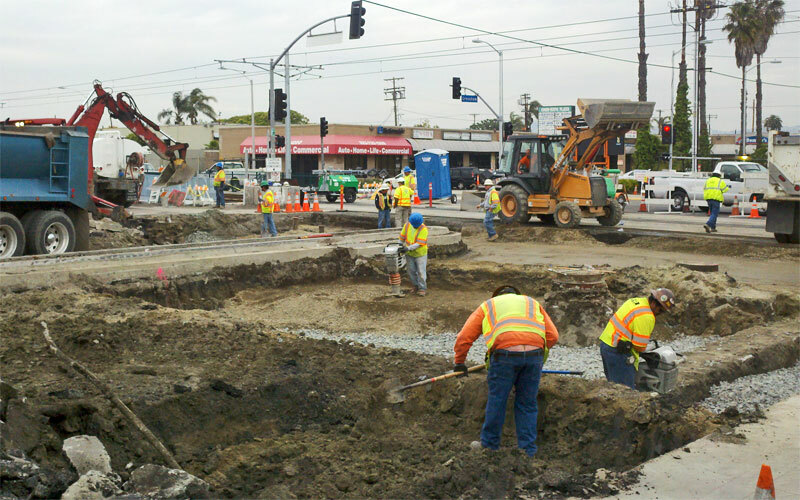 3/23/11 — Major reconstruction of the intersection of Crenshaw Blvd. 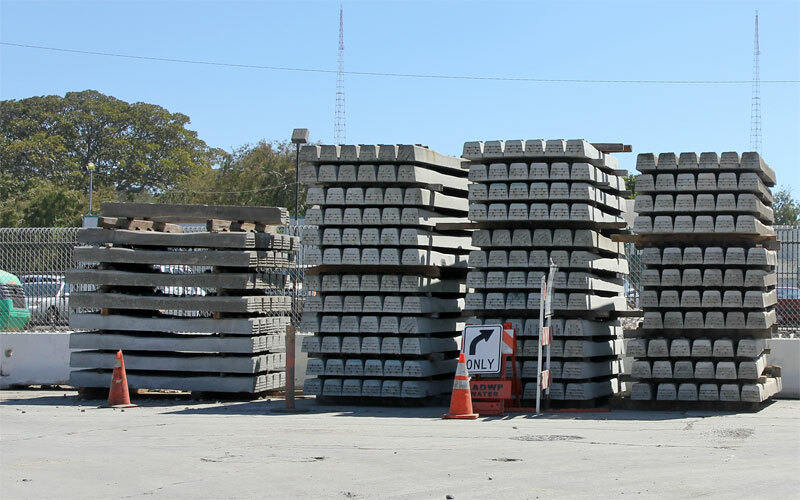 3/18/11 — The yellow edge tiles are installed at Farmdale, to be ready for train testing. 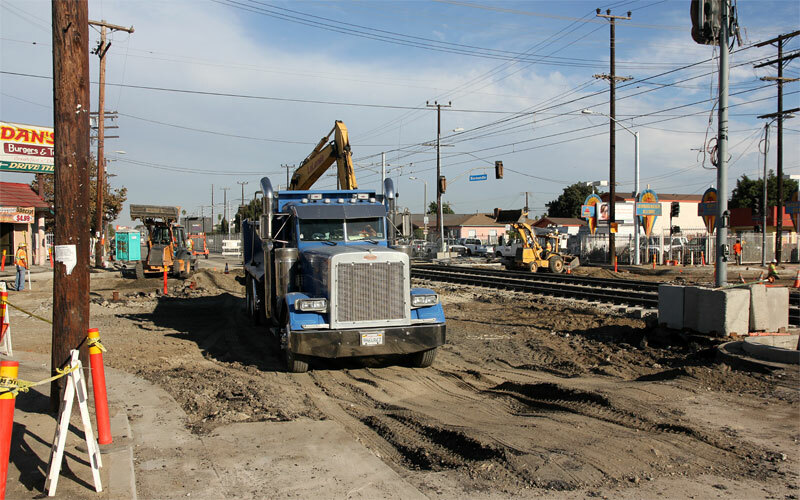 3/4/11 — The existing road is being scraped for new pavement east of Crenshaw. Note the lit message signs at the station. 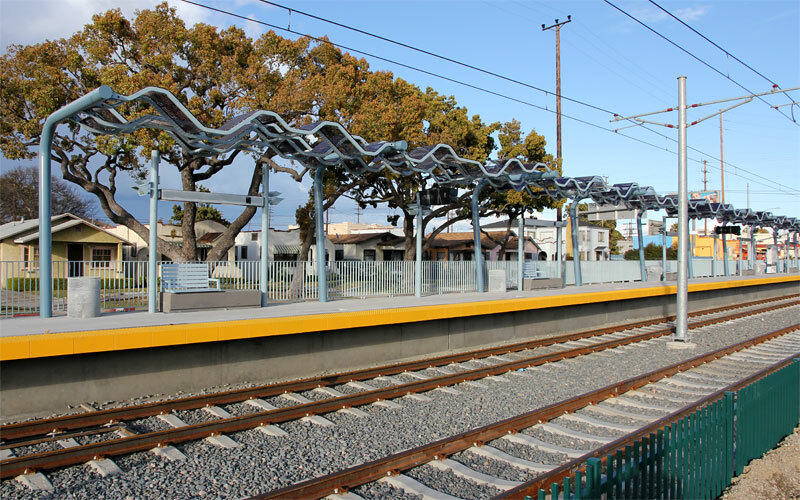 2/26/11 — The Western Avenue station now has seating and trash cans (above), and looks quite nice against the background of camphor trees. Trees have been planted most of the way from Farmdale (below, looking east toward Buckinghan) to Arlington. 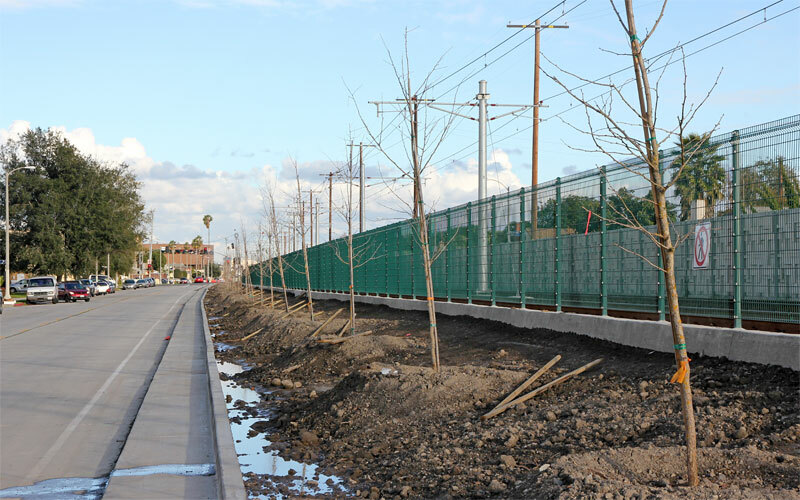 2/11/11 — The first trees were planted east of Buckingham (above, looking east toward Crenshaw). 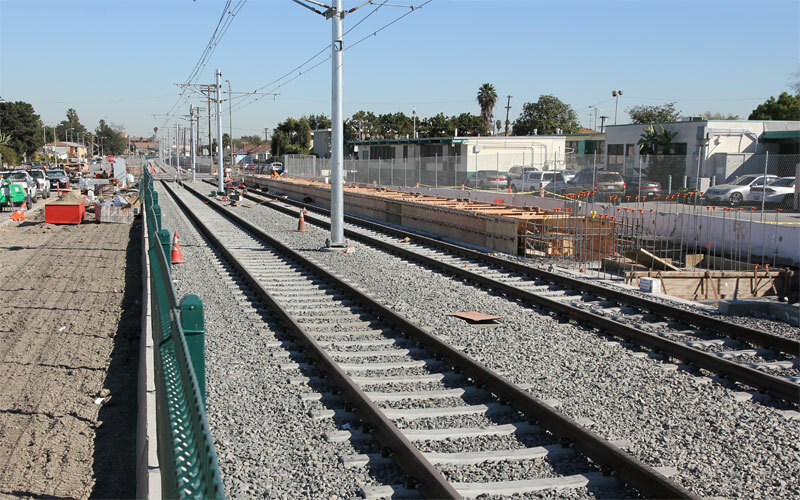 Both station platforms at Farmdale are rapidly being built before train testing begins (below, looking east). 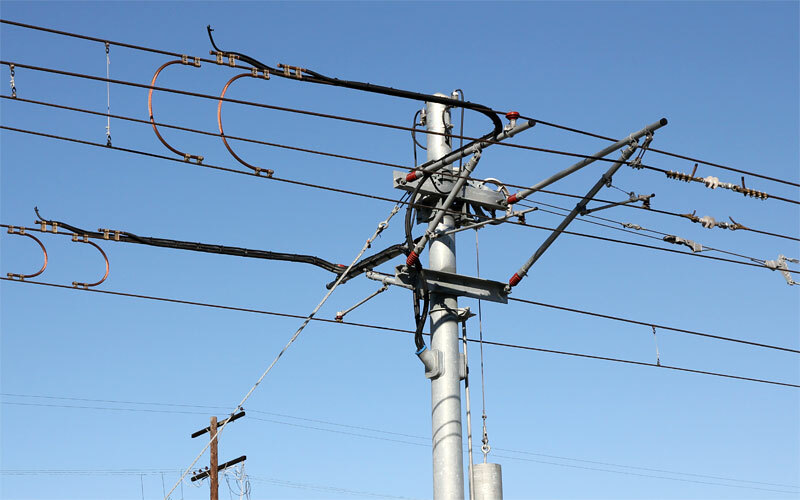 And power feeders are connected to the catenary (bottom; compare with the following two photos). 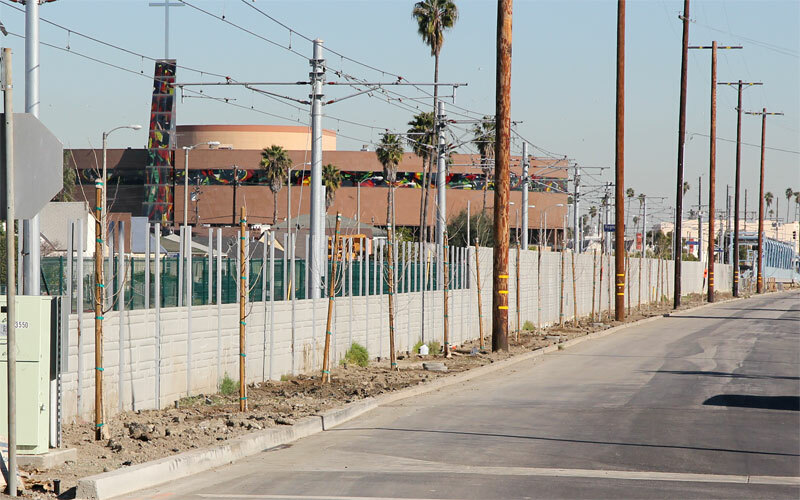 12/9/10 — The green wire fencing is finished west of Normandie, showing its two heights (it's even taller in front of Foshay Learning Center). 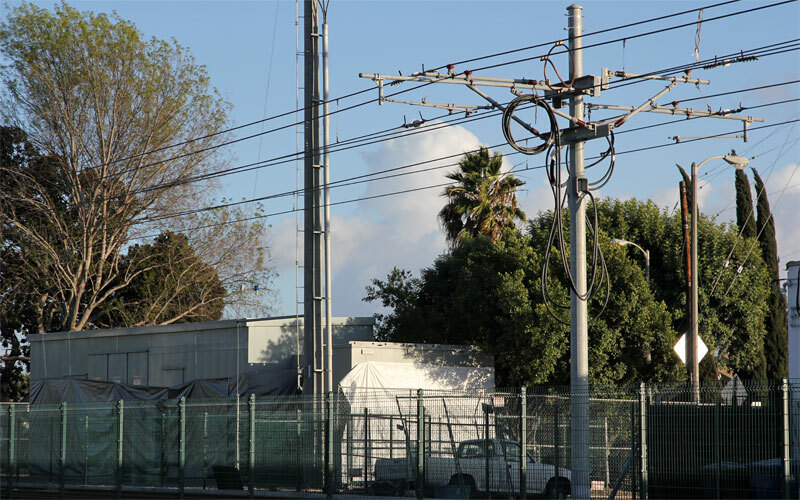 11/21/10 —Power feeder cables are coiled on a pole by the substation west of Gramercy. 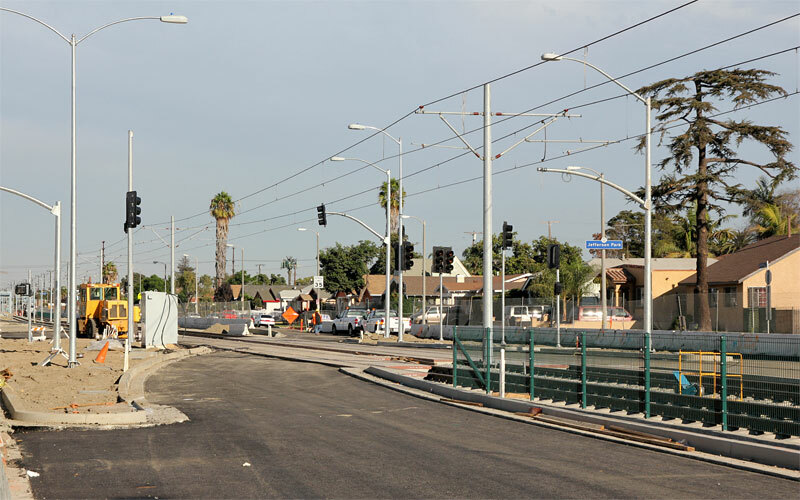 11/2/10 — Trackwork and fencing proceed between Degnan and Crenshaw (above). 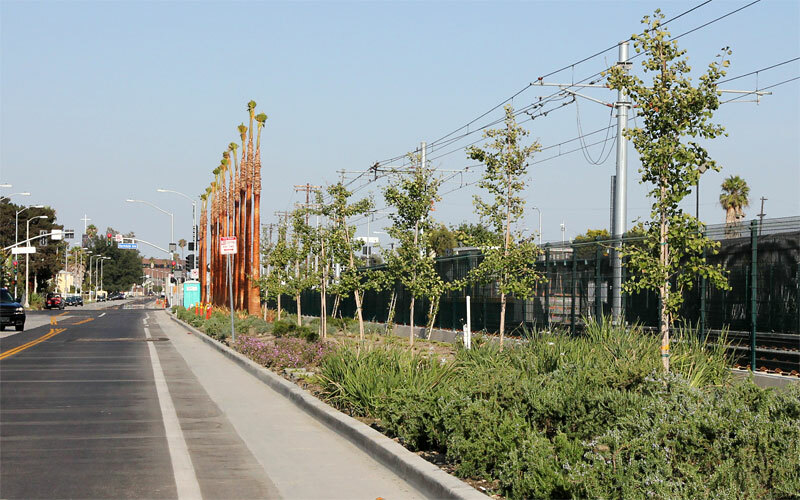 Below is another view of the finished Gramercy crossing, with a magnificent tree on the left. 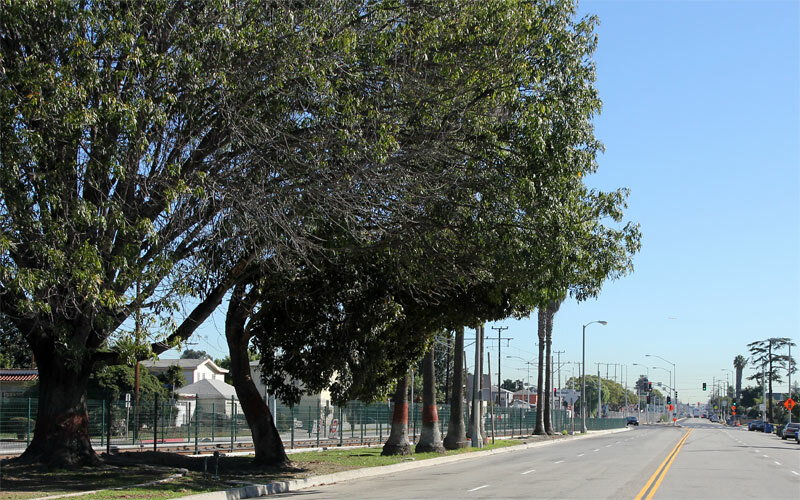 10/27/10 — The intersection of Exposition Blvd. and Rodeo Road at Gramercy has reopened. 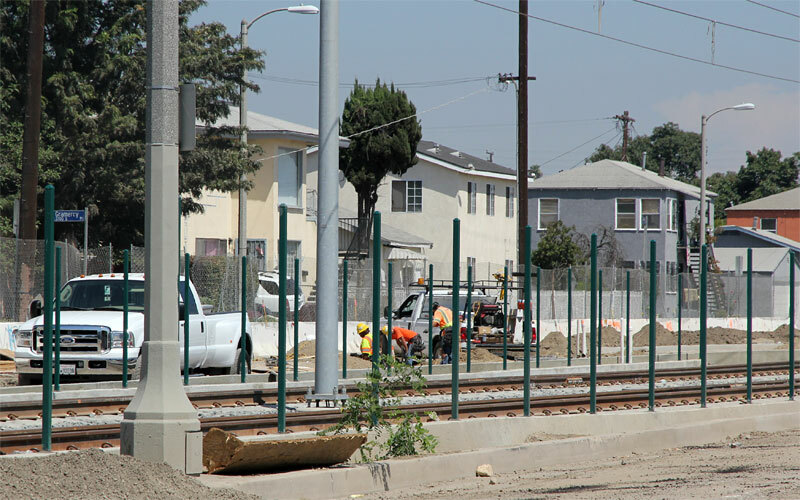 The intersection at Arlington is closed for reconstruction, and green fence posts are beginning to be installed on the sides of the tracks between Vermont and Western. 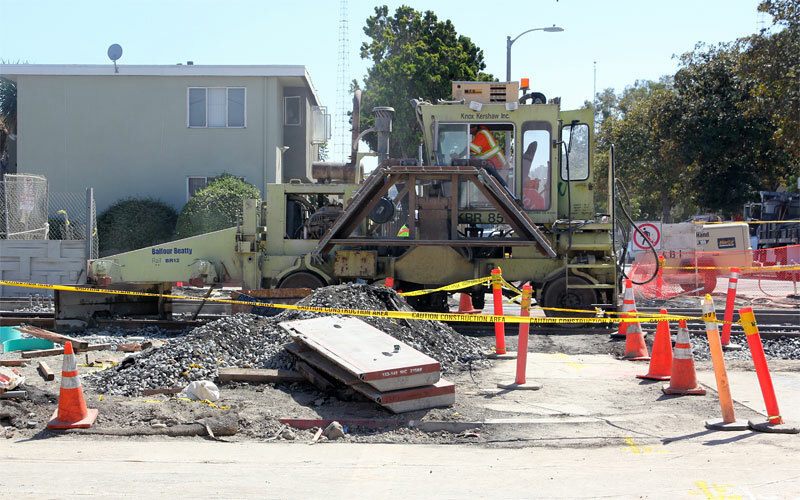 9/30/10 — The intersection at Normandie is dug up for repaving, with just the tracks visible (above), the first of repaving all the intersections west of Vermont. 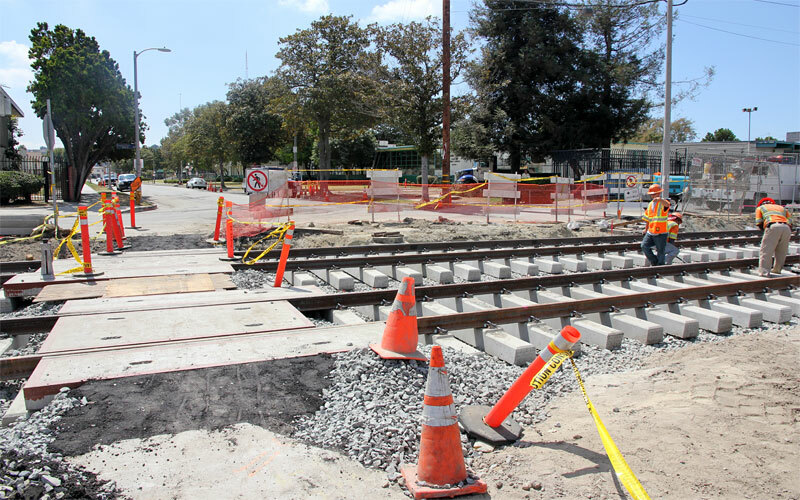 The intersection at Gramercy is nearly finished (below). 9/26/10 — Wire fencing is up most of the way from Arlington to Buckingham, curbs are installed, and sprinkler heads are ready for landscape planting. 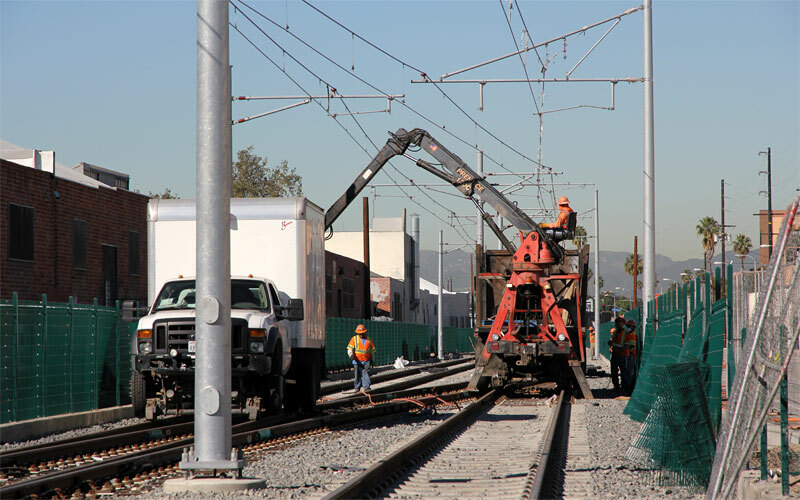 9/16/10 — A ballast tamper (compacts ballast and aligns tracks) is finishing work on the new Expo Line track between Farmdale and La Brea Avenues (best in 720p HD fullscreen). 9/11/10 — The Farmdale crossing is open. 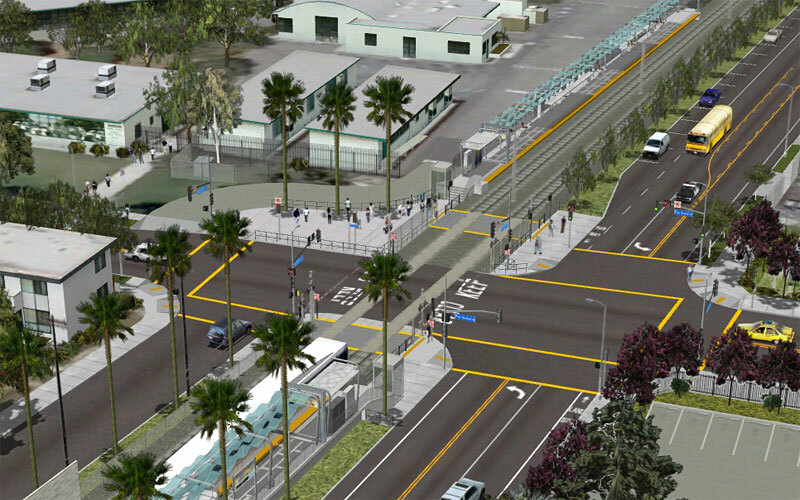 Compared with the simulation below, the final pedestrian crossing is yet to come, not to mention the station platforms. 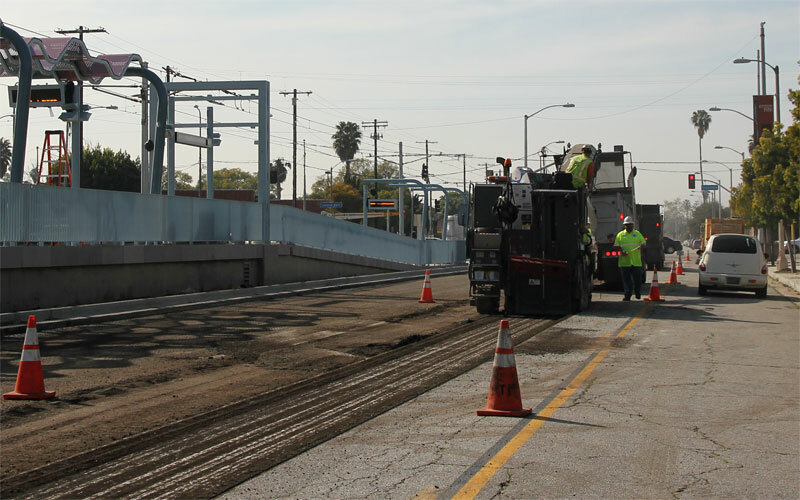 9/10/10 — Ballast is being spread and leveled before the grade crossing is finished. 9/9/10 — Rails cross Farmdale! A lot has happened in 24 hours (following post). 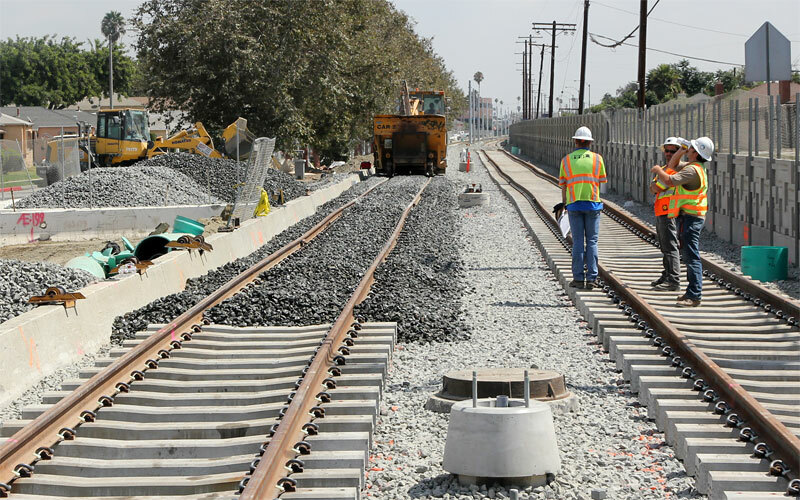 Looking west toward La Brea (below), they're finishing rail clips across Farmdale, but still have a section of rail to install beyond it. Looking east toward Buckingham (bottom) you see a rail hopper spreading ballast on the new track, refilled from the pile on the left. 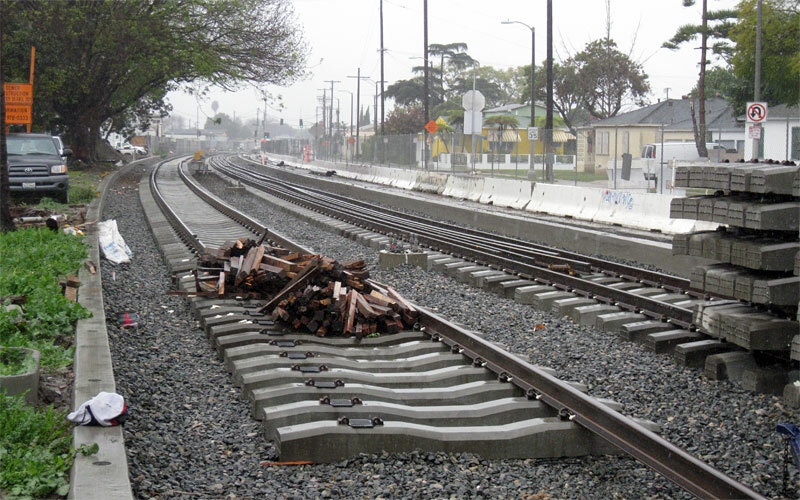 9/8/10 — Ballast has been spread and rails set down through the remaining section, looking west (above) and east (below). Just a couple of days from completion now! 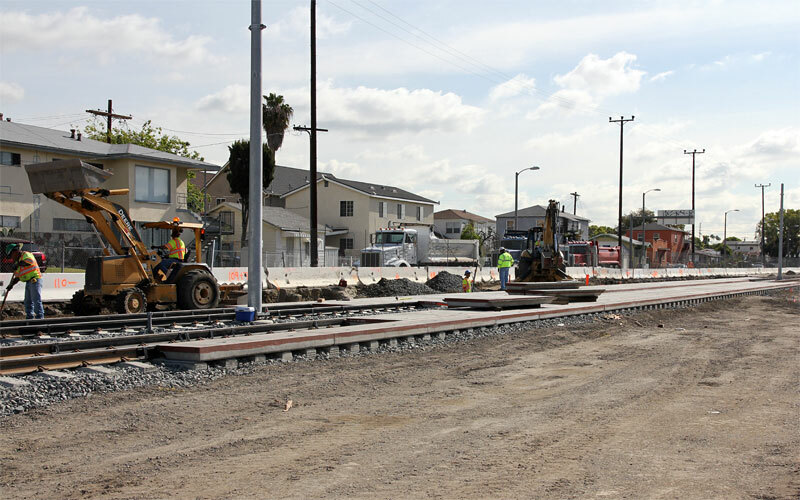 9/3/10 — The Farmdale crossing is ready for ballast and track. 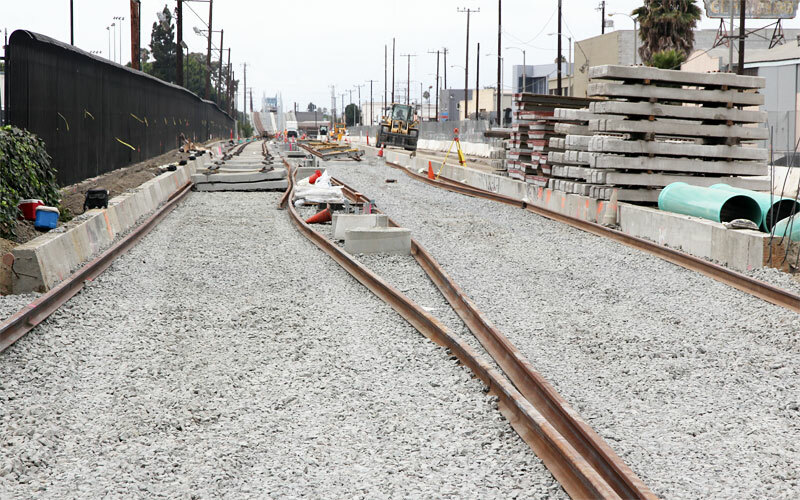 After all these years we're only a few days from continuous rails all the way from next to the Blue Line to Culver City! 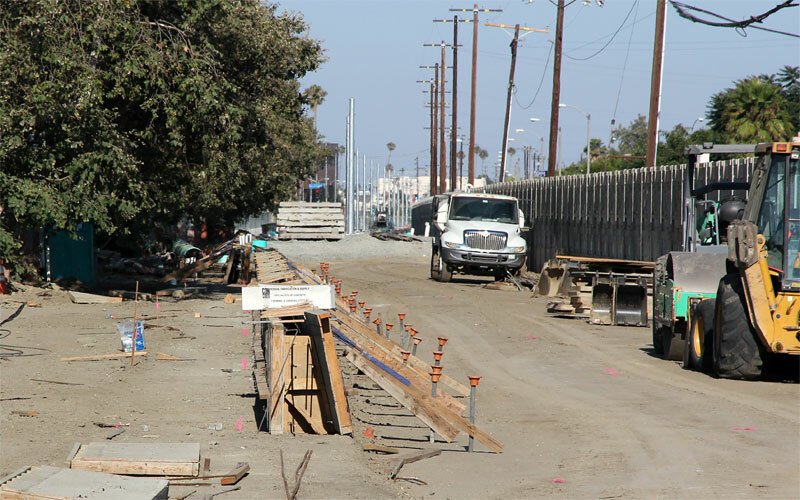 9/2/10 — Stacks of ties (above) and rail ribbons on the La Brea ramp (below) are poised to complete the Farmdale crossing. 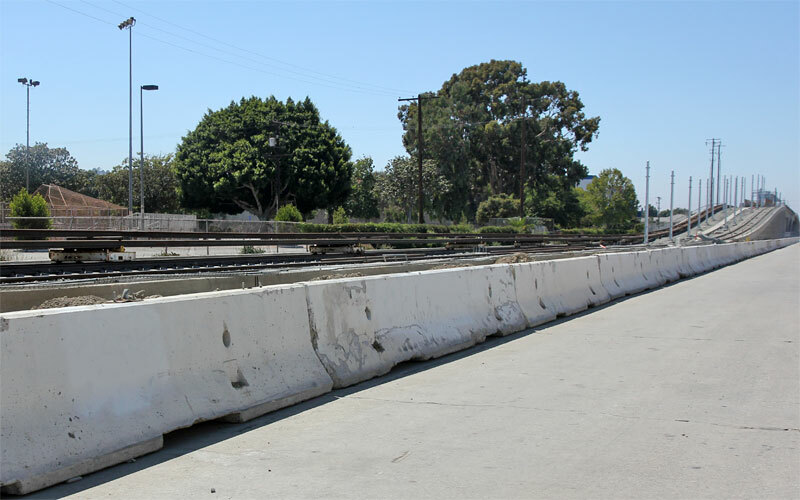 Update: these rails appear to be waiting for the Culver City aerial structure. 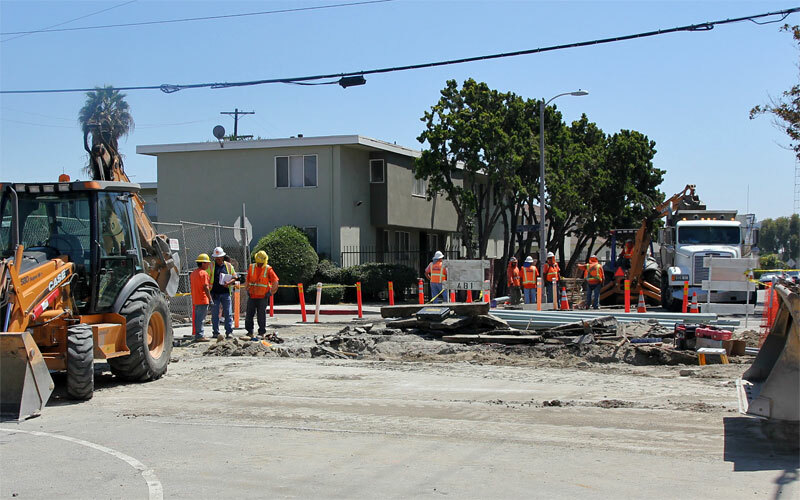 8/27/10 — The Farmdale intersection is closed August 23 through September 12 to complete utility work and lay the tracks before classes start at Dorsey High (above). 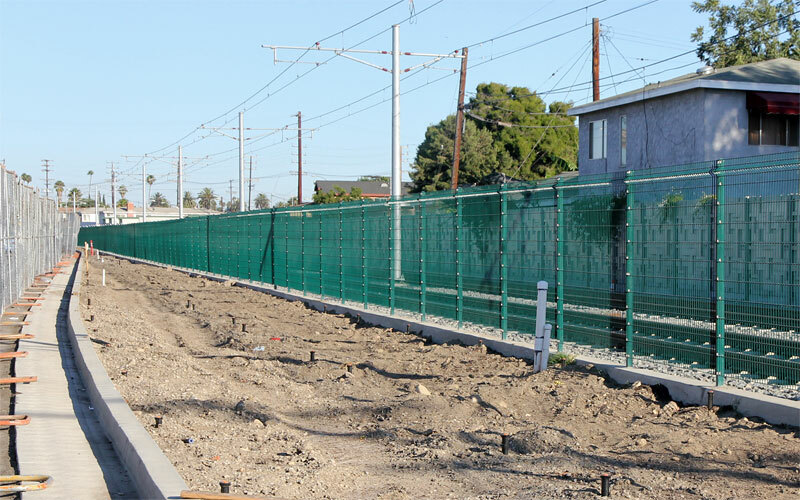 Green fence posts are being installed west of Gramercy where the private right-of-way starts (below). Also, soil ammendment is being spread along the planter strip west of Arlington, in preparation for landscaping to begin. 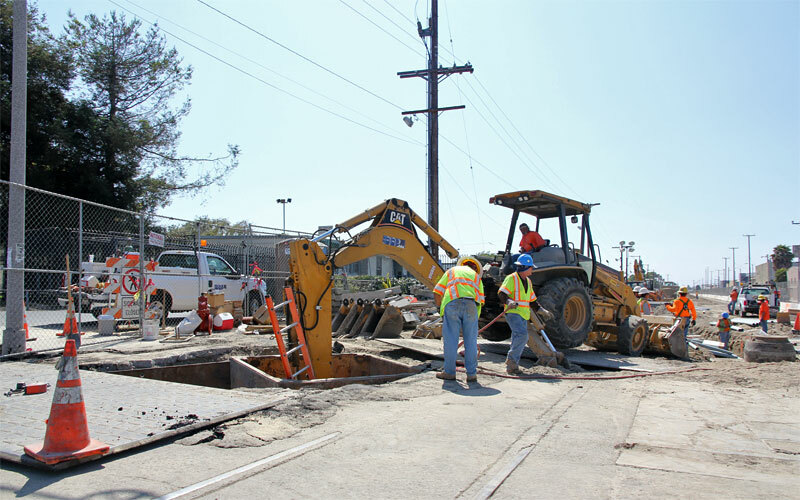 8/9/10 — Utility work (pipes and moving the power lines from the station platform site) must be completed on the west side of Farmdale before tracks can close this gap. The old PE rails are visible one more time. 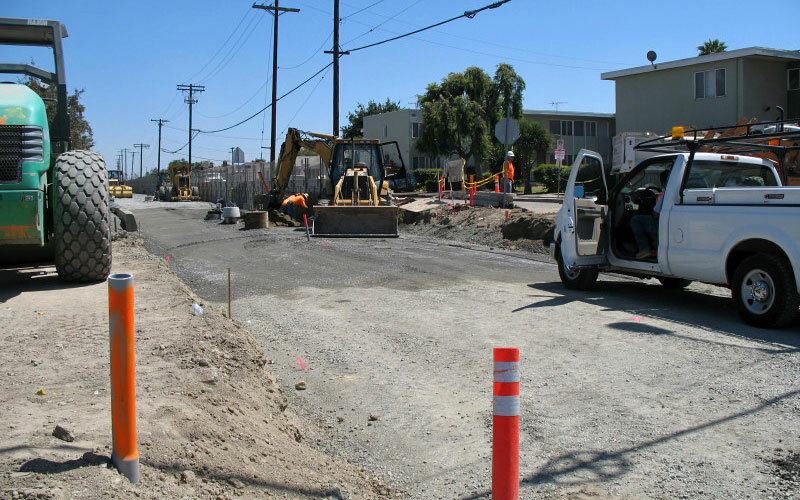 7/24/10 — The ballast curb and station foundation are being extended west to Farmdale as CPUC approval is imminent. 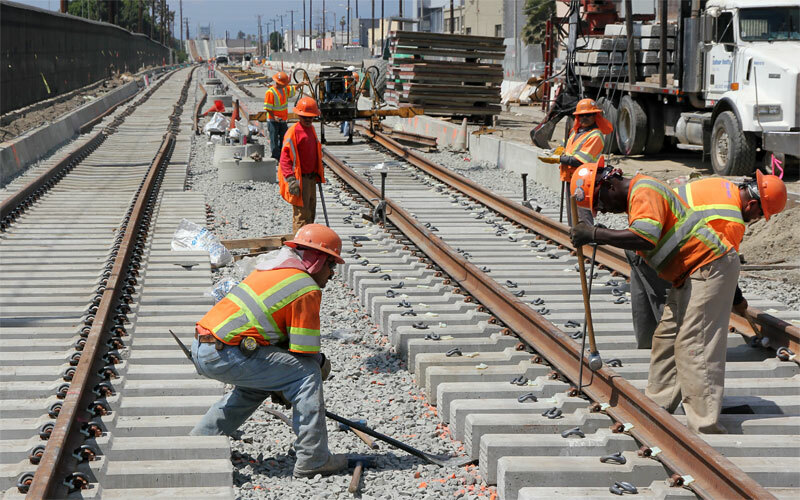 West of Farmdale has been cleared in preparation for track construction. 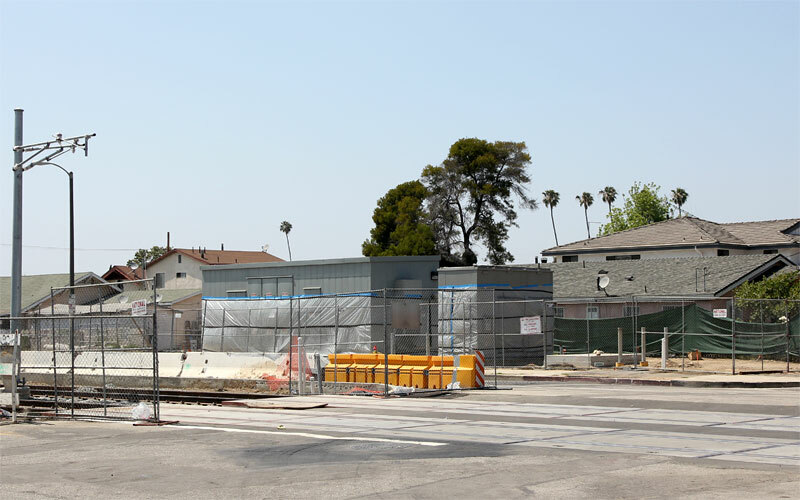 7/15/10 — The Crenshaw station looks nice with West Angeles Cathedral. 7/7/10 — The lower ("contact") wire was being hung on the third OCS span, from Arlington to Buckingham. Below the end is being secured to the end pole just east of Buckingham. 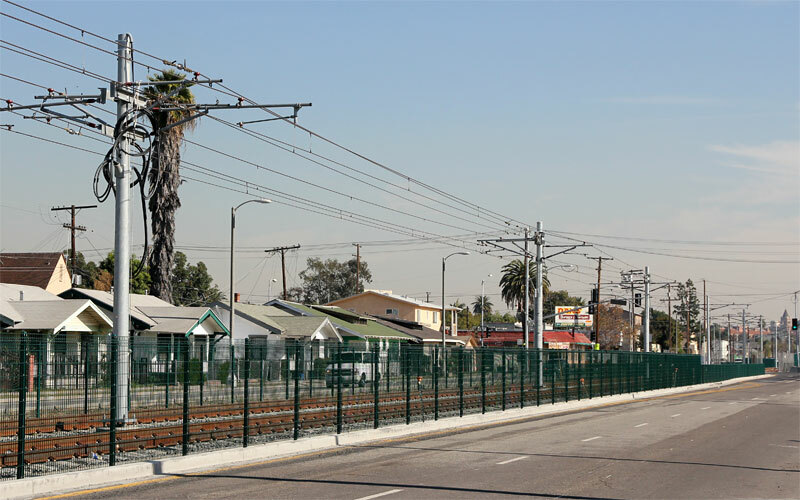 7/2/10 — Fencing is installed at the Crenshaw station platforms (above), as the Expo Line becomes more finished by the West Angeles Cathedral (below). 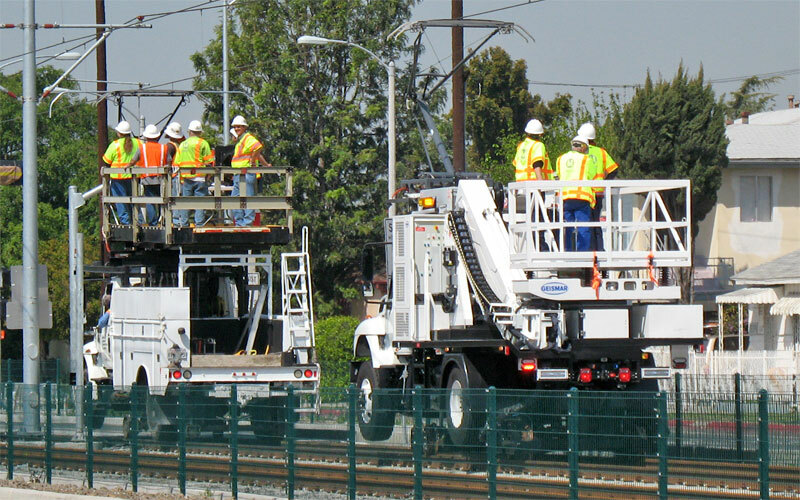 6/30/10 — Hearing the 'twang' of what sounded like a train coming, it was this pair of OCS installation vehicles, part of installing the upper (messanger) wire (best in 720p HD fullscreen). 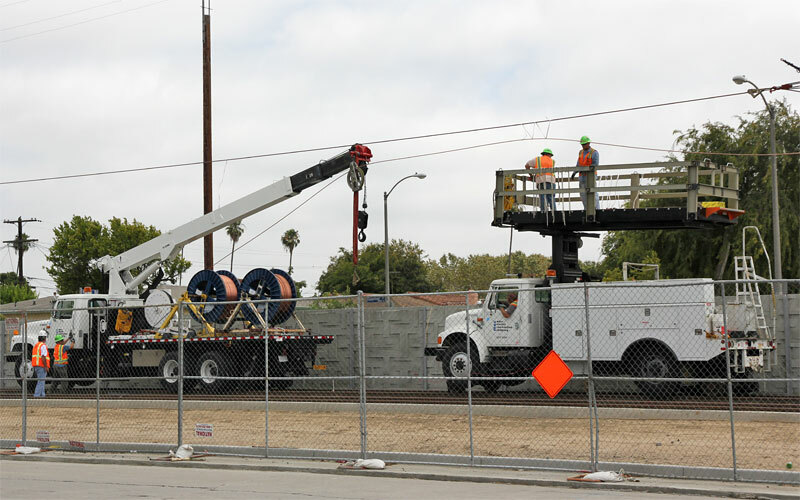 6/23/10 — The upper (messenger) and lower (contact) wires are mostly complete on the first two OCS spans (Trousdale to Arlington), and the first tensioning weight is now hanging at Halldale. 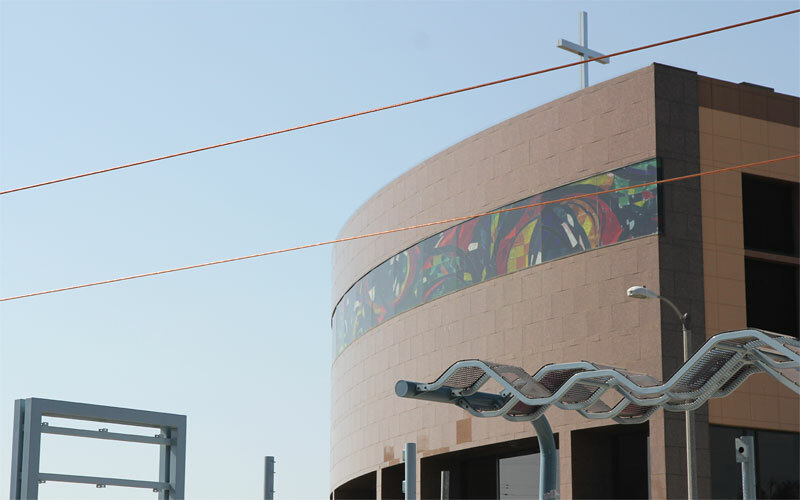 6/10/10 — The first OCS (overhead catenary system, aka catenary) wires were hung this week! 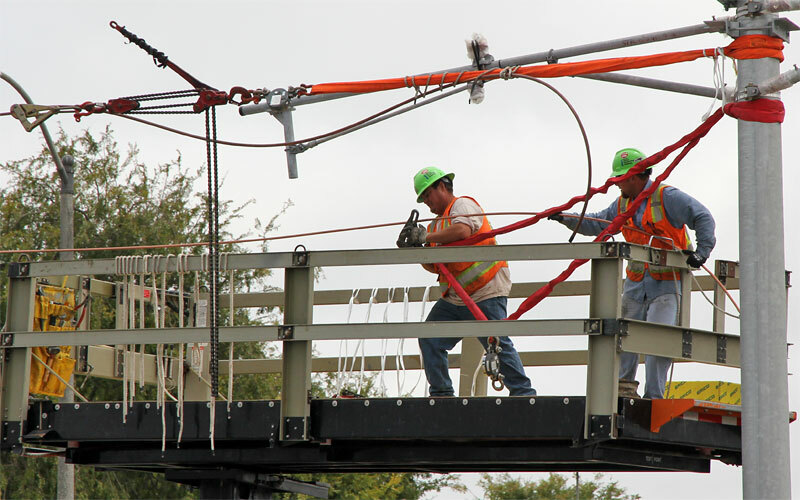 The upper ("messenger") wires of the span from Trousdale to Halldale were up on 6/7; the second span from Halldale to Arlington is up today. The crews below were attaching the hangers for the contact wire. 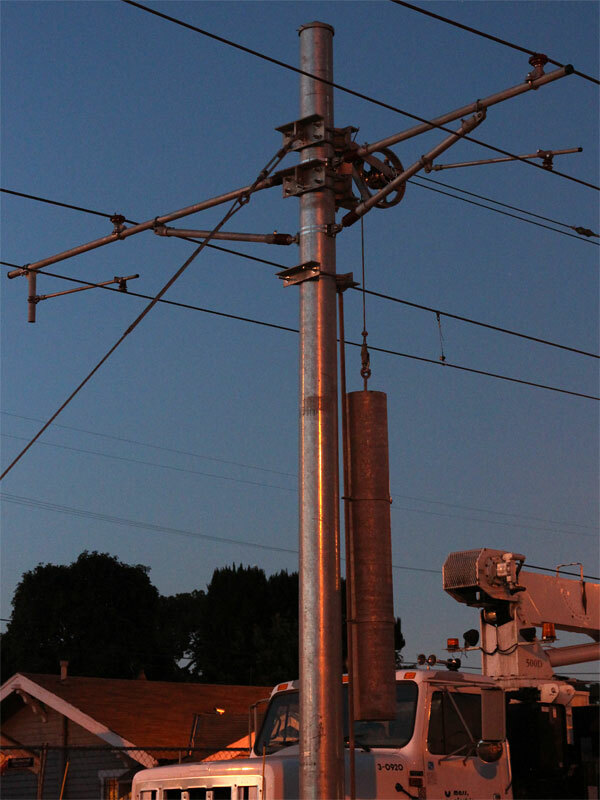 6/4/10 — This is one of the traction power substations (TPSSs) installed overnight during the week before this, at the corner of Halldale (between Western and Normandie). 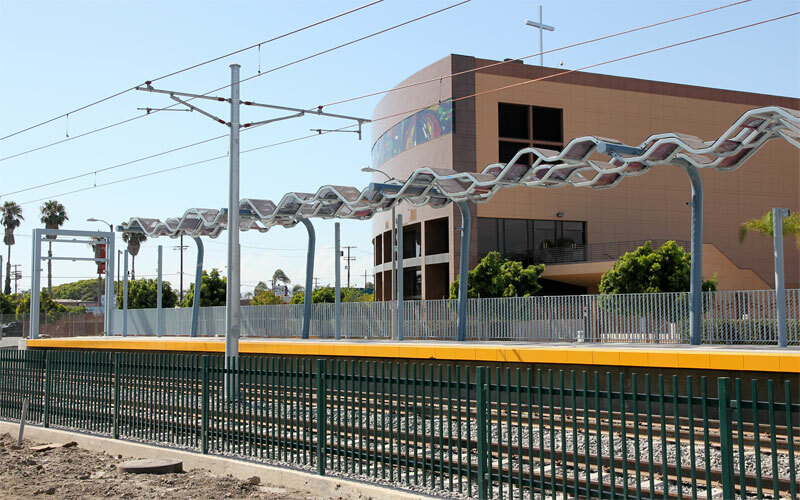 5/19/10  Catenary cross-arms are on all the poles from Buckingham to Vermont. 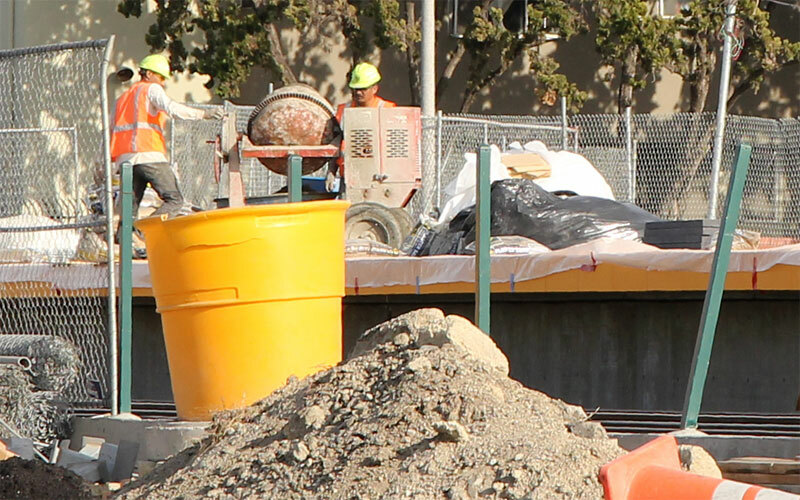 Black poles (not yet with arms) are in from the Vermont to Trousdale stations (but none yet along Flower Street). 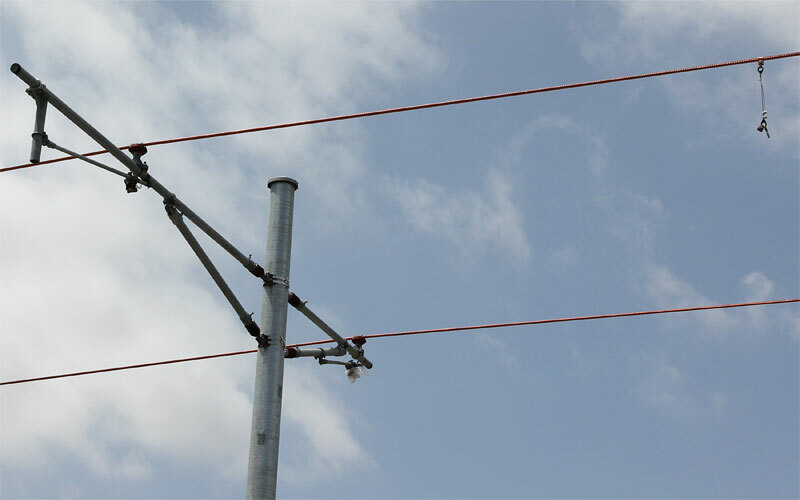 This pole includes a pulley wheel for tensioner weights at the end of a catenary span. 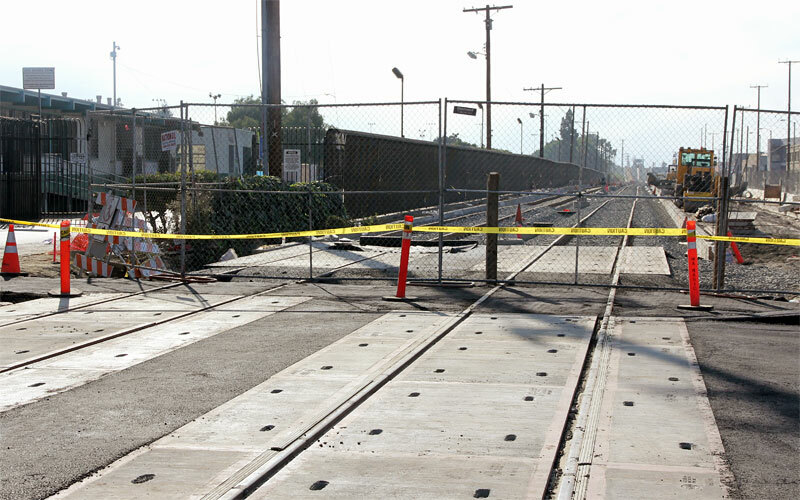 4/22/10  Grade crossing panels are in place for the Gramercy crossing. 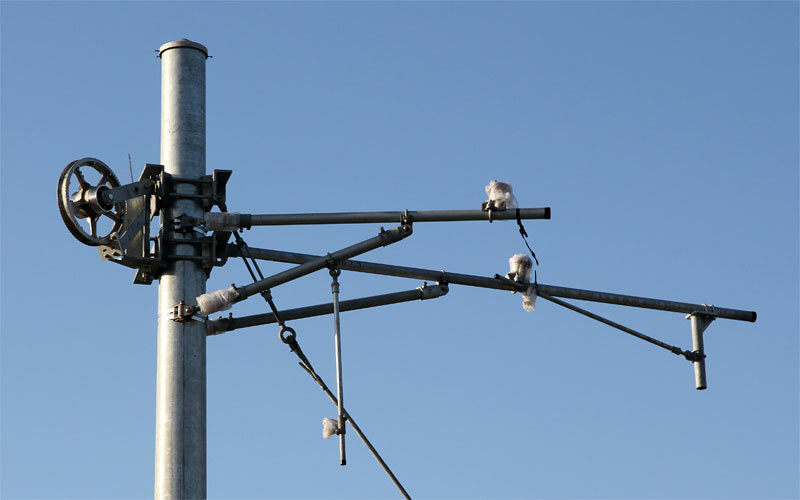 Many OCS (Overhead Contact System aka catenary) poles have been placed all the way from Vermont to Buckingham. 3/17/10  Another milestone! 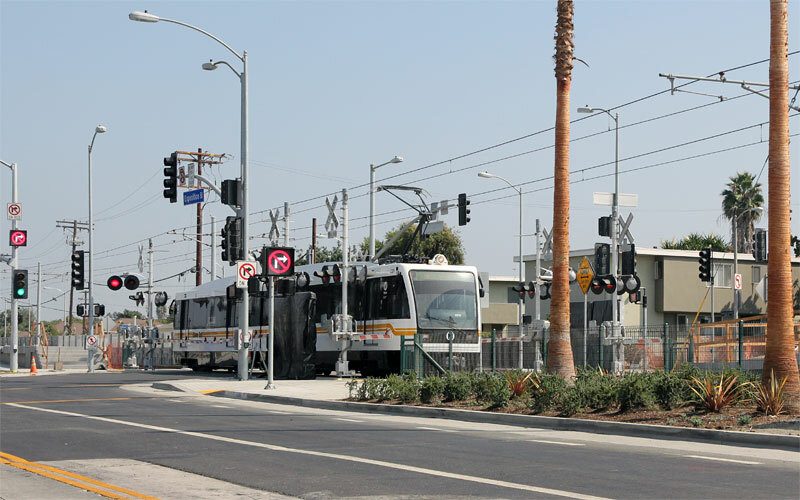 Here are five of the first seven catenary poles standing, on both sides of the Denker crossing. 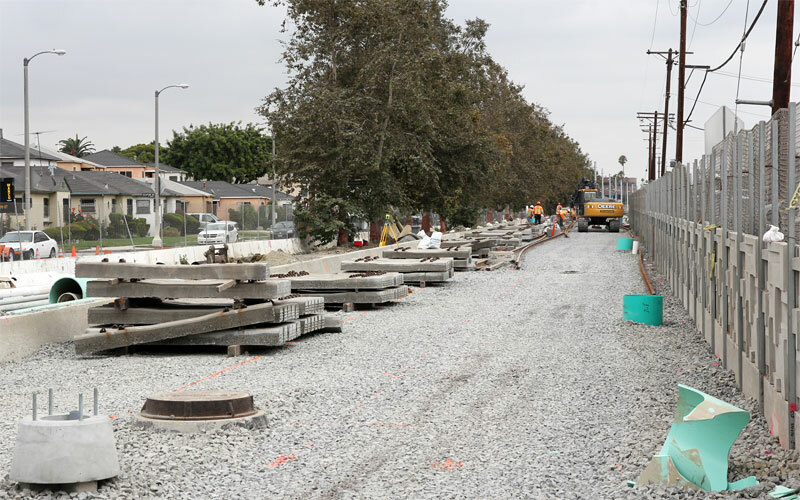 2/5/10  Looking west from the current end of track at Gramercy, as construction continues in the rain. 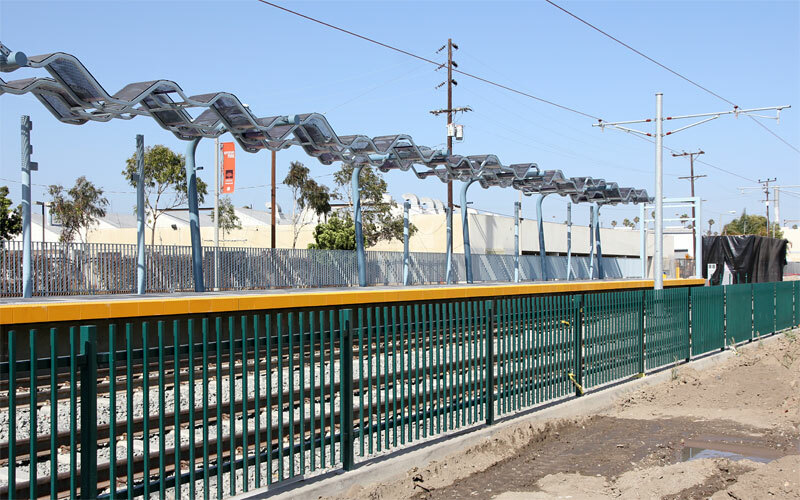 1/29/10  The first "weaving" station canopy was installed on the eastbound Western Ave. platform early this month. 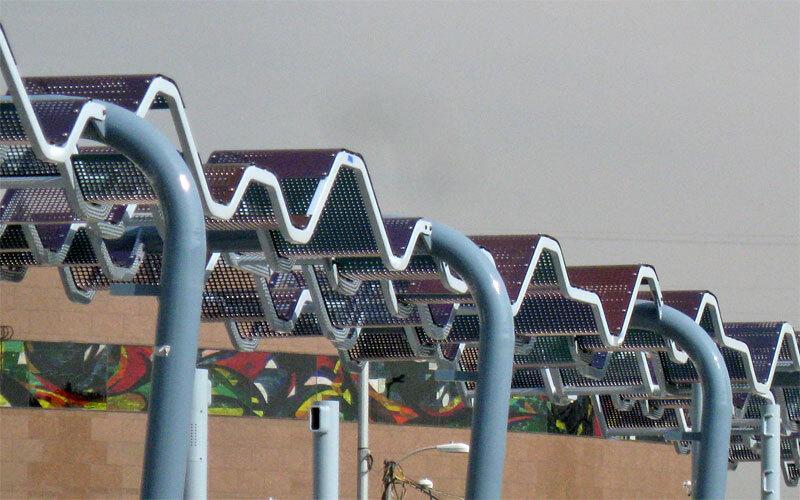 This detail at eastbound Crenshaw Blvd. shows the UV-absorbent transparent layers on the canopy, which shine in colors under the sun. West Angeles Cathedral is in the background.